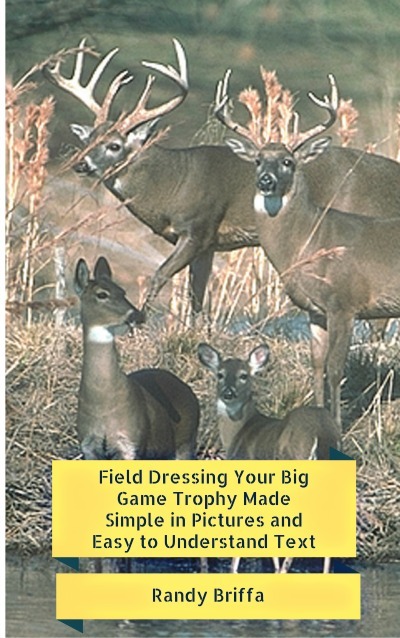 A great strategy used by many for hunting bucks is to follow a whitetail deer doe when the bucks are in rut. When bucks are rutting, they will chase "hot" does relentlessly. A hot doe is one that's in estrus and ready to mate. The theory is that if you follow the hot doe, it will make it easy to locate the bucks. This is a good plan except it's not quite as simple as just going out and stalking a doe. First you have to find the does to stalk. Then you have to figure out how to get yourself positioned for hunting any bucks that come along. Finding whitetail does is an art form in that you have to understand how they travel and feed during the day, and bed when resting, in order to locate them in the first place. The does will normally live in groups with one doe called the lead, or alpha, doe while the others are beta does. A group will also include fawns of varying ages. One of the best places to find a doe is wherever there is plenty of water and feeding vegetation. White tail doe like the type habitat near streams, rivers or creeks. Both does and bucks will follow territory that is long and narrow seeking plentiful food and sheltering vegetation. They like deciduous trees, but the deer are also found near fields and open areas as long as there is plenty of ways to conceal themselves around the edges. Most white tale does spend their entire lives in a small area consisting or approximately 600 acres more or less. When the buck finds a hot doe, it will chase her. When the doe decides it's time to mate she will stand for a period of time and then return to feeding. If you're lucky you will be situated in the right spot when a buck is in wild chase. 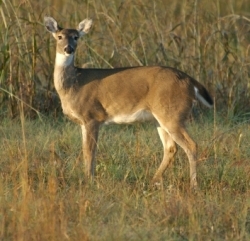 But chances are you will have to locate more than one doe group area during the season. 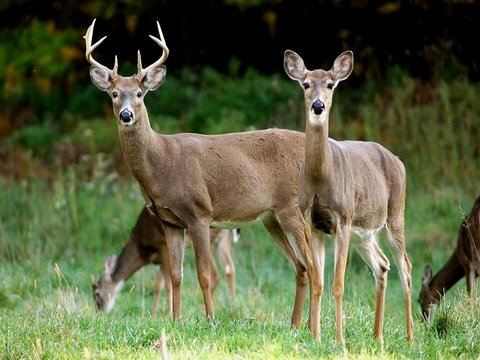 By looking for signs of whitetail deer doe tracks, feeding areas and bedding sites, you will know where to place your deer stand or where to sit while waiting for your chance at a buck. Do not step in the scrape or leave your scent on the licking branch. The best way to hunt a scrape is downwind of it as the bucks will usually come in that way to check for the scent of a Hot Doe. In the future we will devote more on the subject of the Rutting Whitetail Buck. The picture above demonstrates what we have been talking about on this page. The Estrus Whitetail Doe has a good affect on the Whitetail Buck for the hunter in the fall. It especially gives the bow hunter that little extra advantage for a perfect shot opportunity.